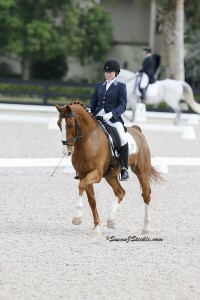 Wellington, FL – December 3, 2013 – Equestrian Sport Productions (ESP) hosted its Dressage at Holiday and Horses competition this weekend at The Stadium at the Palm Beach International Equestrian Center (PBIEC) in Wellington, FL. Home to the Adequan Global Dressage Festival (AGDF), the beautiful facility featured two days of national competition on Saturday and Sunday, November 30 and December 1, 2013. 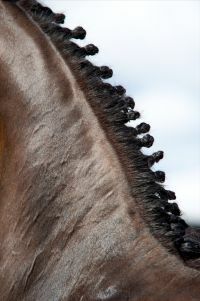 Dressage at Holiday and Horses featured a full line-up of classes to appeal to horses and riders of all levels. 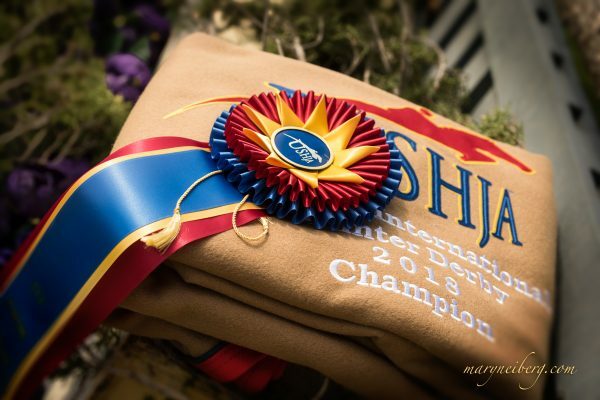 The competition was level two USEF/USDF rated, a Great American/USDF Regional Championship Qualifier, and a Dover Medal Adult Amateur program event. William Solyntjes ‘S’ served as the judge at (C) and Angela Goodwin-Volpert was the TD. Anne Cizadlo, of Wellington, FL, and Oldwick, NJ, had a fantastic show at Holiday & Horses with her two mounts, Talent and Unique, both owned by Paula Runnells. 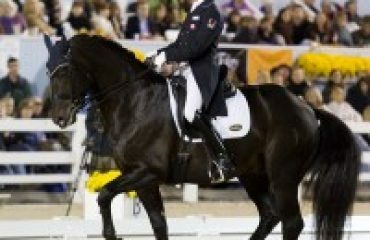 Showing in the USEF First Level Test 2, Cizadlo and Unique scored a 71.081%. They then went on to compete in the USEF First Level Test 3 to earn a 75.484%. Cizadlo also showed in the USEF Second Level Test 2 with Talent to earn a score of 69.605%. 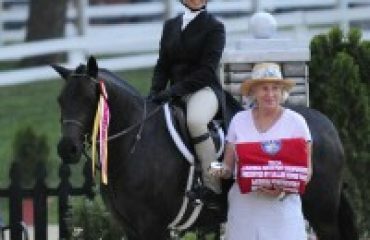 Talent and Unique’s Owner, Paula Runnells, showed her horse Rubilat in the USEF Second Level Test 1 and earned a score of 60.143%. Anne Cizadlo and Talent. Photo (c) Susan J. Stickle. 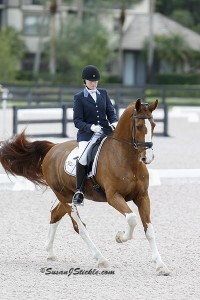 Cizadlo has spent her winters in Wellington for the last 14 years and loves the dressage facility at PBIEC. She had a great weekend with her two mounts, who she has been riding for two years. Talent (13) and Unique (14) are both Dutch Harness horses that Runnell imported from Holland. Cizadlo explained that both horses originally started out as carriage driving horses for several years and then had a change of careers when Runnell took up dressage. Cizadlo was happy with both of their performances this weekend. Anne Cizadlo and Unique. Photo (c) Susan J. Stickle. Cizadlo loves showing at PBIEC, which is just down the road from Runnell’s farm in Wellington, and praised this weekend’s show and the great facility. In addition to Cizadlo’s success this weekend, the Holiday & Horses event featured some great rides from Jennifer Marchand and many others. The FEI Grand Prix saw a top score from Marchand riding Today to a 62.553%. Kelly Layne and Von Primaire scored a 59.255%. In the Prix St. Georges Open division, Marchand had great scores with her three mounts. 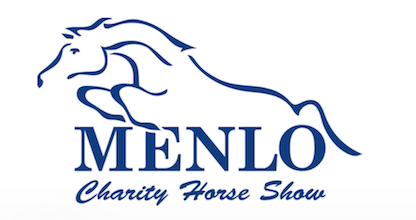 Don Romeo scored a 67.368%, Beshardt earned a 63.684%, and Atreyu II scored a 62.368%. Showing as an amateur, Lily C. Zilo and Windsor’s Aron scored a 64.079%. Lisa Hyslop showed in the USEF Third Level Test 1 to earn a 64.737% aboard Delauren. 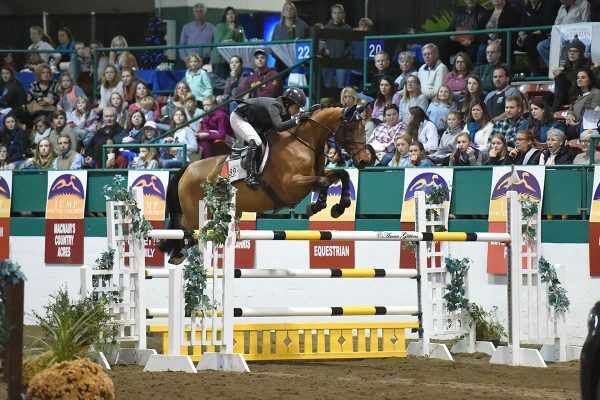 Hyslop also showed Devon to a 63.333% in the USEF Training Level 1. In the USEF Third Level Test 1 Junior/Young Rider division, Ashley Walker earned the best score of 62.105% riding Vermeer HF. 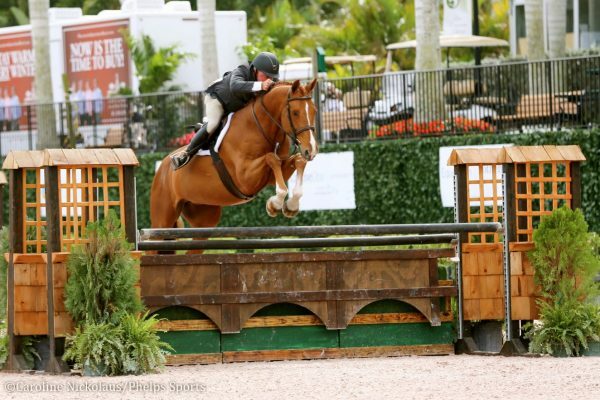 Aless Hall and Unze Funds received a 65.000% for their ride in the USEF Third Level Test 3. Dressage at Holiday & Horses leads up to the start of the winter season in Wellington and this year’s Adequan Global Dressage Festival. The 2014 AGDF begins January 9 and will feature 12 weeks of competition with five national and eight international shows running through March 30, 2014. For more information, please visit www.globaldressagefestival.com.